(Nanowerk News) Millimetre-sized crystals of high-quality graphene can be made in minutes instead of hours using a new scalable technique, Oxford University researchers have demonstrated. In just 15 minutes the method can produce large graphene crystals around 2-3 millimetres in size that it would take up to 19 hours to produce using current chemical vapour deposition (CVD) techniques in which carbon in gas reacts with, for example, copper to form graphene. Graphene promises to be a 'wonder material' for building new technologies because of its combination of strength, flexibility, electrical properties, and chemical resistance. But this promise will only be realised if it can be produced cost-effectively on a commercial scale. The researchers took a thin film of silica deposited on a platinum foil which, when heated, reacts to create a layer of platinum silicide. This layer melts at a lower temperature than either platinum or silica creating a thin liquid layer that smooths out nanoscale 'valleys' in the platinum so that carbon atoms in methane gas brushing the surface are more inclined to form large flakes of graphene. 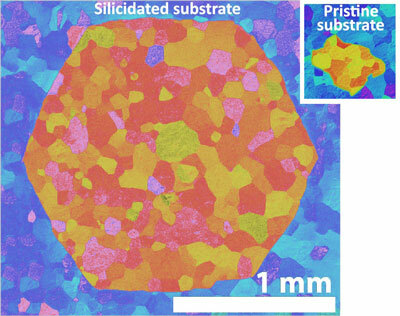 A report of the research is published in the journal Nature Communications "Rapid epitaxy-free graphene synthesis on silicidated polycrystalline platinum"). Size-wise the new approach compares favourably with the common 'Scotch tape method,' in which a piece of tape is used to peel graphene fragments off a chunk of graphite, which produces flakes of around 10 microns (0.01 millimetres). Using CVD with just platinum creates flakes of around 80 microns (0.08mm). But with the liquid layer of platinum silicide the researchers show that graphene crystals of 2-3 millimetres can be produced in minutes. Out of all the techniques currently used to make different types of graphene CVD is the most promising for scaling up into a cost-effective industrial process. The Oxford team believe that their approach could also have benefits beyond speed and quality: with a thicker liquid layer to insulate it the graphene might not have to be removed from the substrate before it can be used - a costly and time-consuming additional step required with all other methods. The researchers say that, in theory, it would be possible to further develop and scale up this technique to produce flakes of graphene in large wafer-sized sheets. This invention adds to the growing patent portfolio of nanomaterials and their production technologies from Professor Nicole Grobert's Nanomaterials by Design Group. Under a commercialisation programme devised by Isis Innovation, the technology commercialisation company of the University of Oxford, the Group are establishing collaborations with industrial partners as an essential part of developing the Group's products for potential applications. Professor Grobert also plans to manufacture and sell her range of specialty nanomaterials as part of a new business venture.